Keep dirt & debris out of fresh water hoses or regulators. Male threaded replacement plugs for most water fills with brass garden hose connections. 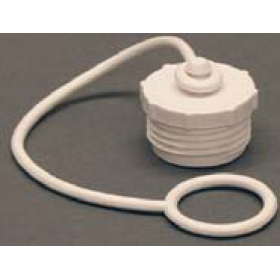 Female threaded cap for use on any male threaded garden hose end or water regulator. Will fit any 3/4" male garden hose thread. Includes strap. White. "Great service, they kept me informed. Received what I ordered very quickly." "extremely fast shipping, received correct part with good installation instructions, will order..."
"I found RV Plus to have the best price, best layout of info and easiest website to use for my..."